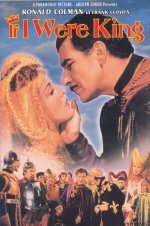 A sparklingly witty and polished historical romp, this gives plum roles to Ronald Colman as the romantic poet and audacious rogue François Villon and to Basil Rathbone as the wily, cackling French monarch, Louis XI, who allows Villon to save him from losing his throne. Preston Sturges's screenplay provides dialogue that is a constant delight, and no one has declaimed poetry better on screen than Colman. Frank Lloyd's direction is admirably brisk and Ellen Drew shines as the ordinary girl who loves Villon without reservation. A rare delight.